May the 3rd 2018 was a big one for the Osaka Cup. After six weeks and a 5,500 NM journey a third of the 18 starters crossed the finish line on the same day. They had been bunched together for much of the journey and it was only the fickle winds in Osaka Bay that decided what order they would cross the line. Kraken came in mid afternoon followed by Electra at about ten thirty that night. Maverick finished next and a little later in wild conditions, Red Jacket and Surf Dude. Then just a light was breaking on May 4th Mr Lucky arrived flying the remains of a torn sail. It had been a tiring night for all concerned but it was great to have them in Osaka. 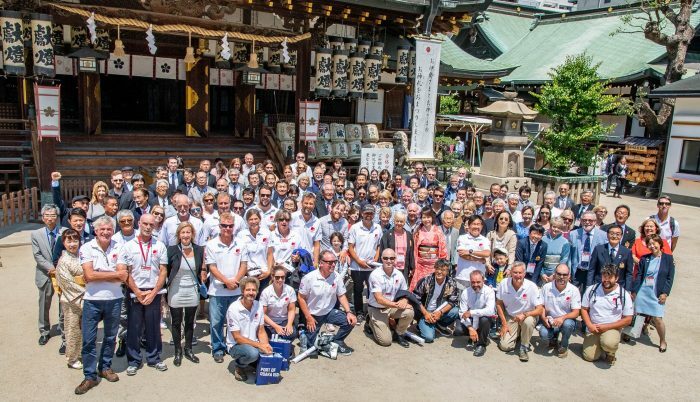 To celebrate the safe arrival of all our fleet in Osaka 12 months on, an Arrival Reunion Party has been organized for Saturday May 4th at the Ken King Center at Sandringham Yacht Club. All competitors, supporters and their families are invited. It will be a Beef and Burgundy night and we have the support of some generous sponsors. On the night there’ll be a video hook up with Hokko Club members to help us celebrate. Finer details of the night will be published a little closer to the date but event organizers need to get an idea of how many will be attending. Please let George Shaw know if you’ll be their, by giving him a call or dropping him an Email.